Amber Karnes is the founder of Body Positive Yoga. She’s a ruckus maker, yoga asana teacher (E-RYT 200), social justice advocate, and a lifelong student of her body. Her commitment to inclusive, adaptive yoga practice empowers thousands of diverse practitioners around the globe. Amber is the creator of the Body Positive Clubhouse, an online community dedicated to building unshakable confidence and living out loud. She is an Accessible Yoga Teacher Trainer and contributor to Yoga International and the Yoga and Body Image Coalition. 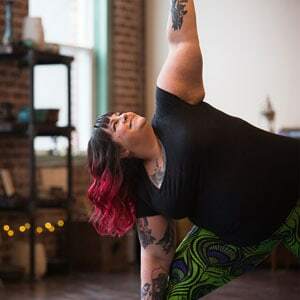 Through her workshops, retreats, and online yoga and wellness offerings, she seeks to further the message of inclusivity, consent, agency, body positivity, and accessibility for all on and off the yoga mat. She lives in Richmond, Virginia, with her husband Jimmy, and blogs at bodypositiveyoga.com.